One of the main attractions that appeals to homebuyers in Bonita Bay are the stunning views of the beautiful natural surroundings. Imagine looking outside of your window and seeing emerald green waters, sugary white sand beaches and blue skies without a cloud in sight. This is the view that buyers are looking for and paying for, and the best way to get it is to live in one of the top high-rise developments in Bonita Bay. There are various real estate options throughout Bonita Springs, but some of the finest developments and properties are found within the master-planned community if Bonita Bay. The high-rise developments in Bonita Bay offer a true resort lifestyle that is characterized by luxurious accommodations, modern architecture and finishes and outstanding amenities that rival those of a five star hotel. Bonita Bay is home to 57 different neighborhoods where you can find a wide range of real estate options including single-family homes, estate properties, condos and townhomes and the finest high-rise developments in Southwest Florida. The high-rises at Bonita Bay are surrounded by lush beauty right off the coast and are known for the architectural marvels, spectacular design and the panoramic views of the Gulf of Mexico and Estero Bay. The development was designed to create an environment where residents can truly feel comfortable and at home amid Florida’s extraordinary tropical nature. Much of this community is dedicated to lakes, nature preserves, open space and parks. The development is beautifully adorned with outstanding landscaping and fine details implemented in the design. Residents enjoy a wealth of amenities as well as the charm, safety and comfort of living in a master planned community where everything is literally at their fingertips. Azure at Bonita Bay in Bonita Springs is one of the newest high-rise condo developments situated within Southwest Florida’s beautiful gulf coast. Azure incorporates a wide range of delicate ecosystems from fresh and saltwater marshes to mangrove stands, hardwood hammocks, a pristine river and creek and Estero Bay that opens up to the Gulf of Mexico. Residents can enjoy unmatched breathtaking views from their unique condo units including stunning sunrises, sunsets and magnificent views of Estero Bay and the Gulf of Mexico all day long. The high-rise development stands at 26 floors, 77 units and five different floor plans for interested buyers to choose from, which range in size between 3,400-square feet to just over 4,200-square feet. The development also offers world-class amenities such as a community golf course, tennis courts, a community pool and clubhouse, a fitness center and boat docks for residents who own personal vessels. Bayview is made up of two high-rise buildings that stand at 12 floors each. Bayview has 110 units and offers five different floor plans that range in size between 2,700-square feet to just over 4,400-square feet. The Bayview structures are located within the master-planned community of Bonita Bay and are surrounded by more than 1,200-acres of open space. Amenities at Bayview include a BBQ and picnic area, a beach club, biking and jogging paths, community pool, exercise room, basketball courts, golf courses, tennis courts, a fishing pier and so much more. Esperia South is a luxury high-rise development in Bonita Bay that was built in 2007 and offers 119 residences in a 28-story building. Residents can enjoy the stunning gulf and Estero Bay views as well as luxurious amenities and accommodations throughout the development. Buyers can choose from six different floor plans that range in size between 2,000-square feet and just over 3,400-square feet. 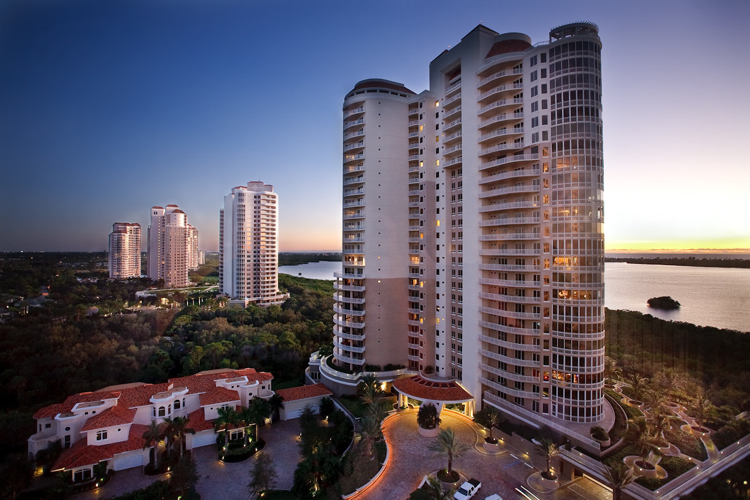 Vistas is the first of six luxury high-rises that were built by Lutgert along the Estero Bay. The impressive building stands at 25 stories and offers magnificent views of Ft. Myers, Lovers Key State Park, Sanibel Island, the Gulf of Mexico and more. Buyers can choose from six different floor plans that range in size from 2,600-square feet to just over 4,200-square feet. Vistas Bonita Bay offers a fun tiki bar area next to the community pool, a health club, grilling area and many other luxurious amenities. There are many other high-rise developments in Bonita Bay including Estancia, Horizons and Tavira. If you are seeking a truly amazing Southwest Florida property where you can experience the highly desirable Bonita Bay lifestyle you are sure to be pleased by the options available at these top high-rise developments. If you are interested in learning more about these developments don’t hesitate to connect with Dan Humbert and Alberto Quiceno at DNA Florida Real Estate. As top realtors in the area they are more than qualified to assist you with all of your real estate needs and to help you find the perfect home in Bonita Bay.